Yesterday, I ran my first two writing workshops for 2018, presenting poetry writing boot camps as part of the City of Bunbury libraries school holidays program. 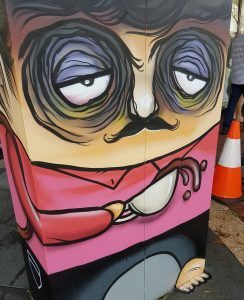 I had a lot of fun using photos of some of Bunbury’s amazing street art as picture prompts to create poems. Apart from the wonderful chance to meet and share with enthusiastic young writers, another thing that delighted me was that two teachers – one at each session – told me that they would be trying similar activities with their own classes when school goes back. Hooray! Teacher PD by stealth! And on their holidays. Which of course made me think of how much I love visiting schools (which I posted about last week), and how, having an author visit your classroom might not just motivate students to read and write, but can also act as a form of professional development for the teacher, demonstrating new ways of teaching writing, which is an area lots of teachers say they find challenging – something, as a teacher myself, I completely understand. So, if you are wanting and extra reason to justify having an author visit your school or classroom, think of it as meeting PD requirements. And, if you’d like, you can add an after-school PD session to the program! If you’d like me to visit in 2018, you can contact me here.